Early bird registration and abstract submission will close on August 30th 2018. Applications for student travel grants will still be possible after the deadline. We are looking for a master student (m/f/v) in Bioinformatics / Informatics for the research group Bioanalytical Chemistry (PD Dr.
Schwudke) at this time in the field of Lipidomics. The goal of this master's thesis is to develop algorithms that will allow to incorporate lipid quantities into the lipidome homology computation. For this purpose an optimization function needs to be defined that helps to maximize the accuracy of the homology metric and should improve associations of phenotypic data to lipidomes (Eggers et al. Scientific Reports 2017). The Research Center Borstel is an international science company, funded by the German federal government and the state of Schleswig-Holstein with 550 employees. Our central task is research and patient care in the field of respiratory diseases. We operate both, infrastructure of basic research as well as a medical clinic. We have one goal: to improve existing methods for the detection, prevention and treatment of lung diseases and to develop new, innovative therapeutic approaches. The Research Center Borstel encourages female candidates to apply and will be treated favourably in case of equal qualification. Disabled applicants with equal qualifications will be considered on a preferential basis. The 66th ASMS Conference on Mass Spectrometry and Allied Topics of the American Society for Mass Spectrometry took place in San Diego from June 2nd to June 7th. and presented the latest advances in LipidCreator, a Skyline plugin for targeted lipidomics. Today, we are very pleased to announce the SpeCS v.0.7 release. The new version enables now to utilize XReport (Xcalibur, Thermo) generated peak lists as import into SpeCS. Such generated peak lists can directly be used as Query in SpeCS without any modification (see also Readme-File). Additionally, this release contains an updated library of LMs for the Q Exactive with 13 new lipid mediators. 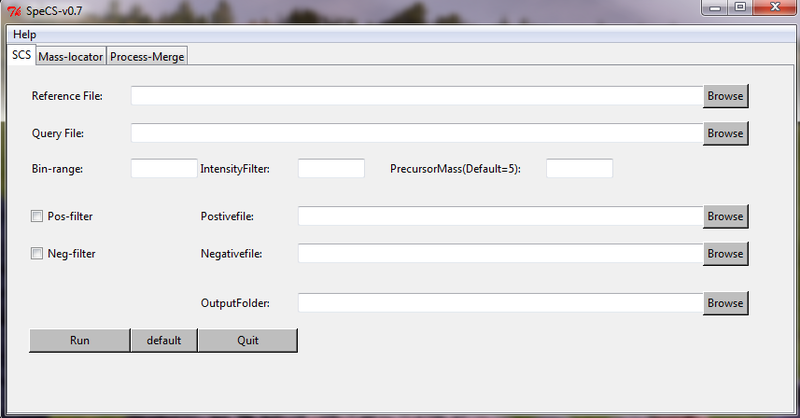 GUI for the calculation of the Spectra Comparison Score (SCS). SpeCS is able to automatically filter peak lists by matching with a library of background or target mass lists. Peak lists are compared considering user definable settings for mass accuracy and intensity threshold settings. The calculation of the score is based on Spearman's rank correlation of matched signals. The article Identification of key lipids critical for platelet activation by comprehensive analysis of the platelet lipidome was recently published in the international journal Blood. In this paper, Bing Peng and co-workers report the first quantitative analysis of dynamic platelet lipidome modulation, revealing key lipids being altered in platelet activation. They further identify SMPD1 as a powerful modulator of the platelet lipidome and its activation via regulation of lyso-sphingomyelin.